Most numerous light tank used by the Allies in the invasion of Normandy on D-Day was the American built M5A1 Stuart tank. It was uses as a scout tank for recognisance work. Its gun was okay for confronting lightly armoured enemy vehicles but could not penetrate the the frontal armour of the Panzer IV, Panther or Tiger tank. 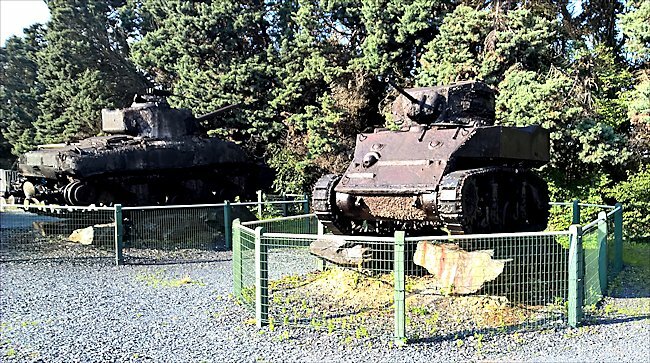 You can see this M5A1 Stuart Light tank at the D-Day Underwater Wrecks Museum or in French the Musee des Epaves sous Marine du Debarquement. It is situated on the D6 road from Bayeux to the charming Normandy costal village of Port-en-Bessin-Huppain. It is on the right as you pass the sign for the Chateaux La Cheneviere restaurant. The complex grounds are screened by a wall of tall evergreen trees. Sticking above the tree tops is a crane and normally three flags; the French tricolour, British Union Jack and American Stars and stripes. Slow your car down as you pass the Chateaux as the museum entrance is very quickly upon you. The Museum is open every day between 1st June to the 30th September 10am to 1pm closed for lunch and then open again 2pm to 7pm. In May it is only open at the weekend. From 1st October to the end of April it is closed. The M5A1 Stuart light tank was armed with a 37mm M6 AT gun and three cal.30 (7.62mm) M1919 machine guns. On machine gun was affixed to the top of the turret, another next to the main gun and a third in a ball mount in the hull. Its protective armour ranged in thickness from 13mm to 51 mm. It had a four man crew: commander, driver, gunner and loader. It was powered by a twin Cadillac V8, 296 hp air cooled petrol engine that gave it a maximum road speed of 36 mph (58 km/h) and off road speed of 18 mph (29 km/h). The stuart had an operational range of around 99 miles (160 km) before it needed to refuel. 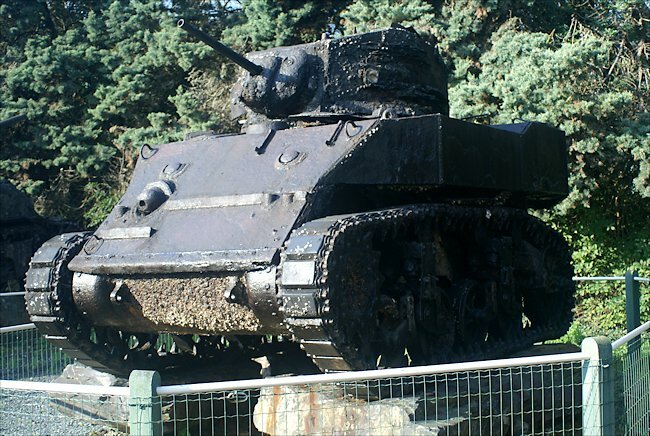 You can see the raised engine compartment at the back of this M5A1 Stuart Light tank that is its identifying feature. M3 Stuart tanks had flat engine hatches.